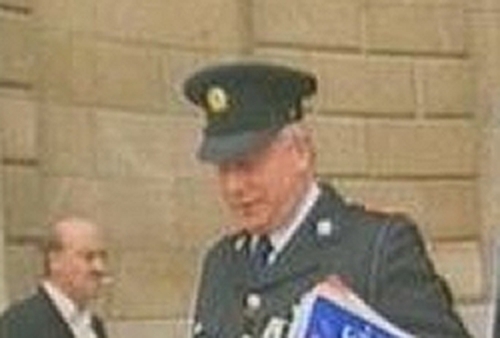 The Morris Tribunal has found that two members of the Garda Síochána orchestrated the planting of ammunition and hoax explosives in Co Donegal. They are Superintendent Kevin Lennon and Detective Garda Noel McMahon. In a report on the explosives finds, which was published this morning, the inquiry headed by Mr Justice Frederick Morris also found that the superintendent and the detective lied to the tribunal. The inquiry has called for immediate action to be taken. At the publication of the report, the Minister for Justice, Michael McDowell, said he would write to Supt Lennon today, asking for any submission he may make before the Government decides upon his position. The Garda Commissioner, Noel Conroy, will decide on the position of Detective Garda McMahon. The report says that senior garda management in Donegal failed to uncover the activities of the two men. It also makes a finding of gross negligence on their part by allowing the hoaxes to continue. 17 members of An Garda Síochána are criticised in the report, in varying degrees from gross negligence to being uncooperative. The Garda Representative Association said the Morris report saddened all hard-working members of the gardaí who were committed to policing this State in difficult circumstances. The GPA is seeking a meeting with the Garda Commissioner to discuss the report's implications and says it will review its own practices and procedures as a result. The Government has said it fully accepts the findings, which Minister McDowell has described as extremely serious. Speaking on RTÉ Radio, the minister said that, prior to the report, he had initiated legislation to reform the management of the gardaí, and that he would now work to accelerate this legislation. Mr McDowell said there was no doubt that if there had been proper garda management in Donegal, the events described in the report would not have taken place. He said the great majority of gardaí are honest, and he wanted them to know that he was standing by the force and would bring it through this crisis. The Garda Commissioner has set up a working group under the Deputy Commissioner, Peter Fitzgerald, to examine the tribunal's recommendations. This working group will report within a very short time frame and implementation of the recommendations will follow. Click here to see the full Morris Tribunal Report on the web.